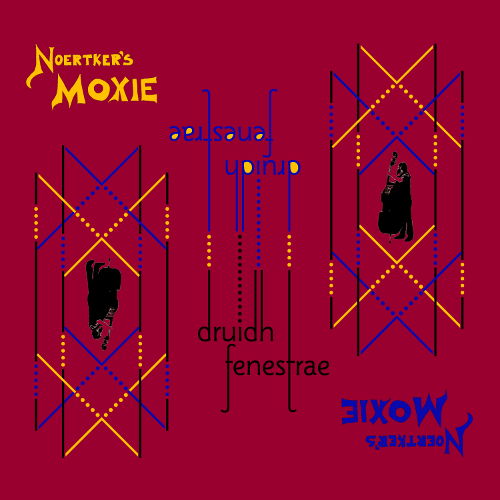 The druidh Bill Noertker, his long-time musical partner Annelise Zamula, and his psychedelic avant-chamber jazz ensemble, Noertker’s Moxie, are back with druidh fenestrae, the third album in the druidh series. The tunes on this album are windows bringing light to some of Noertker's thematic impetuses: childhood chants, poetry, math puzzles, word play, syllabic abbreviations, chicanery, critiques of religion, James Joyce, and Greek mythology. The compositions instigate spirited and playful musical conversations amongst the improvisers assembled here. By turns robust, brittle, quirky, deadpan, hypnotic, outspoken, and seductive; a wide range of expression is explored by Noertker and his merry band. In 2001, Bill Noertker formed Noertker’s Moxie as a vehicle for his thematic compositions. Since then he has composed over 175 pieces of music and has released ten CDs on the Edgetone Records label, including the extended suites Sketches of Catalonia and the Blue Rider, and the soundtrack for Curious Worlds.